New to yakitori? Try this selection of the most popular skewers on the menu. With a balanced variety of meat and sauces, this dish is the perfect gateway into the yakitori world. They’ve taken yakitori to a whole new level. 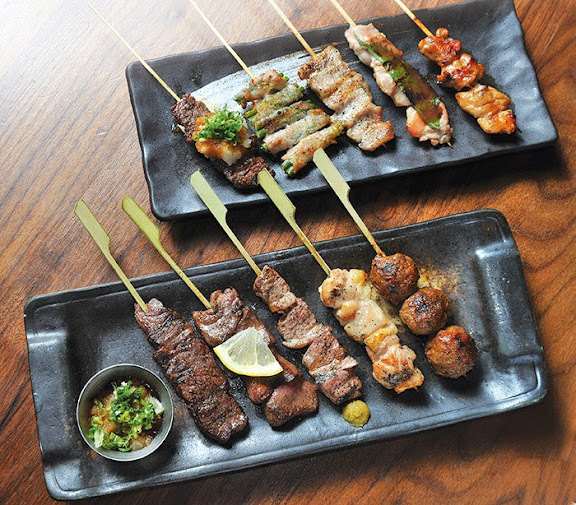 After tasting this selection of top-class meat, from Japanese beef to duck breast, you’ll consider yourself a yakitori expert. Oropon sauce: This grated radish and citrus sauce adds a fresh, tangy flavour. It is a very Japanese thing to take something ordinary and perfect it until it’s something extraordinary. Even the simplest of foods like yakitori, which is just a Japanese name for grilled food on a skewer, can be elevated to a whole new level of deliciousness. If you don’t believe it, head down to Zakkushi and taste it for yourself. What really sets Zakkushi’s yakitori apart from all the competition is their use of binchotan charcoal. Binchotan is a prized white charcoal made from Japanese oak. It is nearly pure carbon, so it produces no flame or odour while retaining heat at even temperatures. When the skewers are cooked over binchotan, it brings out their natural flavours and locks in their juices for that perfect bite. Zakkushi was the first restaurant to bring this technique to Canada 10 years ago, and its chefs have been studying and improving it ever since. So when it comes to the grill, you know you’re in good hands. With over 40 different kinds of yakitori and more than a hundred items on the menu, it will take you several visits to really get the full experience of what Zakkushi can offer. But don’t worry. The restaurant’s handmade d.cor and energetic atmosphere are enough to make you want to go back. From now until the end of the summer, Zakkushi is offering diners a pitcher of Sapporo Beer for just $9.99—so, if you’re looking to spend a warm summer evening with cold beer and juicy yakitori out on the patio, Zakkushi is the place to go. Biting into these crunchy fried chicken balls will fill your mouth with flavour—they’re uniquely enhanced by a kind of fermented rice called koji. What makes it so special? Topped with a softboiled egg and mayo, this dish has a savoury taste that goes beyond your typical yakitori don. Grilling with binchotan charcoal is not as simple as it looks. With temperatures reaching up to 1,000℃, timing is crucial. It’s a skill that takes patience and dedication to master.